Have you ever wanted to feel like you could fly? 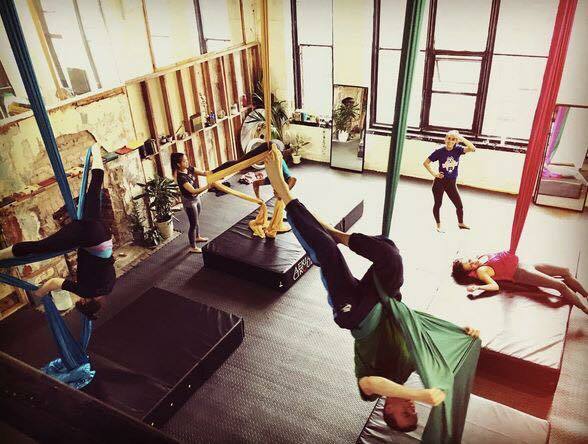 Aerial Cirque currently offers aerial, aerial yoga, and flexibility classes for all ages conveniently located in Dublin city centre. Develop a strong core and overall body tone by learning the graceful combination of dance and athleticism while flying in the air. Don’t think you’re strong enough? Not to worry, most people can’t climb or do a pull-up when they first begin. You just need a willingness to learn something new and have fun! While most of our aerial classes are offered in consecutive 5 week terms, we also offer a few drop-in aerial classes for improver level and above, drop-in flexibility, Open Studio practice times, and Taster Workshops. Check our booking schedule for specific class info and to book your spot. Don't know what level you are? Check our Understanding your Level page. A 2 hour beginners workshop dedicated to giving you a fun taster experience on the aerial silks. Ever wanted to give the silks a try? This workshop is for those who are new beginners. In this 2 hour workshop, we’ll start with a warm up and then learn a sequence on the aerial knot/cocoon. Be prepared to swing, spin, invert, and have fun! It’s best to wear a long sleeve layer and leggings or sweats. Students begin with learning different climbs, foot locks, and then work their way up to inversions, sequencing, and even drops!These class will contain a warm up and conditioning component to optimise your ability on the silks. The class size is very limited to ensure that everyone gets individual attention. 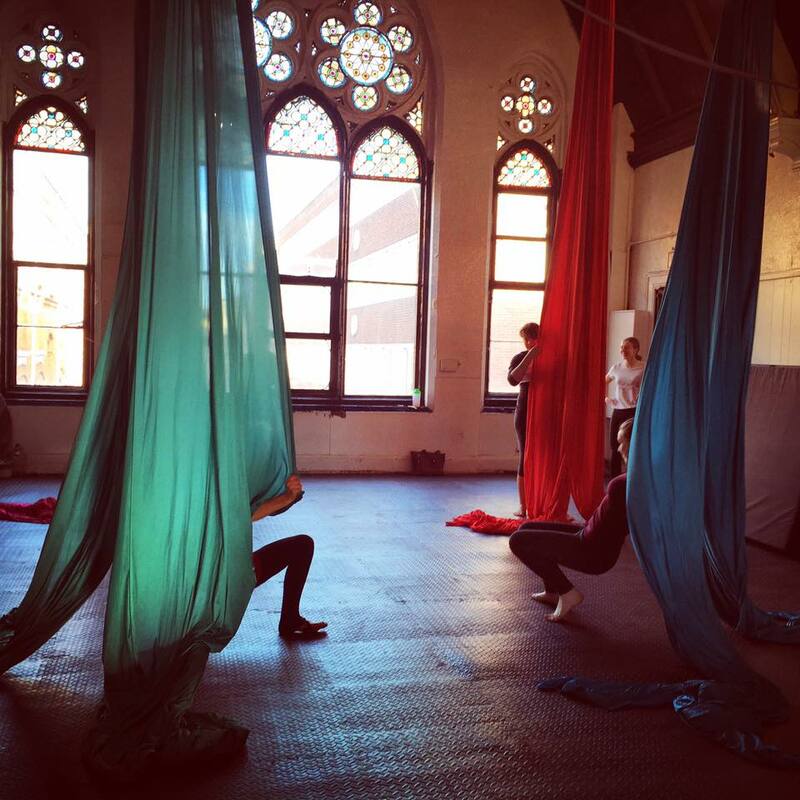 Get your body into shape while learning the grace of aerial silks! In this class, you will learn various ways to mount the single point hoop and various skills, transitioning one move to the next to create a fluid sequence. Once you feel comfortable and confident, we will factor in spinning while dancing through the sequence. Corde lisse moves are normally a combination of held postures and drops using a rope that hangs from the ceiling. We use covered ropes of the highest standard in the industry. Whether you're working on splits, straddles, backbends, or working up to a chest stand, this class is a great advantage for those looking to increase their flexibility and range of mobility, ultimately opening up new repertoire in the air. Open studio is a self-led practice time to come in and practice what you have learned in previous classes or work on an act. It is a great way to build strength and re-affirm skills. Open Studio is available to anyone; however if you are new to the studio you will need to schedule an assessment with a coach before attending your first Open Studio. While we do encourage students to work together and help one another, skill sharing or teaching one another is strictly prohibited. Please note, that only the smaller studio is available during the first half hour to warm up. Please wear opaque leggings with no zippers and a top that can be tucked in. It is also advised to bring a long sleeved layer. All jewelry must be removed before you begin. Socks can be worn during the warm-up, but they will need to be removed in order to work on the equipment. Classes and courses are non-transferrable. If you miss a class, you can come to an Open Studio session in lieu of your missed class, and you have until two weeks after your course finishes to use it. Open Studio is a self-led practice session. You do not need to sign up beforehand, but you will need to give the date of the missed class instead of paying when signing in at the studio. Students paying for practice time get priority, but booking closes an hour beforehand and after that it’s first come, first serve in the studio for the remaining spots. A missed Open Studio cannot be made up, but you can swap or sell it. It is your responsibility to find someone and manage the financial exchange. You must send an email to info@aerialcirque.org to give the teacher 24 hours notice. You may cancel your place and get a refund, minus a €5 booking fee, up to 72 hours prior to your first class of the term by clicking the orange button at the bottom of your confirmation email (it is not possible to defer your booking until the next term). After the 72 hours, we are unable give a refund or transfer to another class time.